It is predominantly communities of color or poverty that show a marked decrease in access to fresh foods. The Food Trust, a nonprofit dedicated to ensuring access to healthy, affordable food, compiled 131 studies from the past 20 years and found that 46 percent of low-income areas and nearly 80 percent of non-white residents in some states, such as New York and California, lack healthful options. The Union of Concerned Scientists, another nonprofit, also found an inversely proportional link between the access these residents have to fresh produce and the rates of diabetes, a highly damaging disease that dramatically reduces life expectancy and costs individuals (or society) almost $8,000 a year in medical costs. Communities of color or poverty, therefore, are seriously affected by their lack of access to fresh food. Despite the dangers and societal costs of obesity, the federal government has historically underfunded the fight against it. As a result, many communities are launching their own innovative projects. One of these is the creation of community gardens. These plots of land could be crowd-funded, and their yields could go to providing fresh fruits and vegetables to the locals. Then, by inviting nearby farmers to form farmer’s markets, locals simultaneously introduced a variety of cheaper produce and supported the growth of local laborers. Fondy Farmer’s Market and the East New York Farms! Market, for example, have thrived in the past few years despite serving communities with around 39 percent poverty rates each. The most significant change results from enticing larger supermarkets to establish chains in the neighborhood. For every new supermarket in a census tract, Americans consumed anywhere from 11–35 percent more fruits and vegetables. Not only does this improve alimentary habits, it also lays to bed the misconception that high-calorie, nutritionally-deficient diets are always a matter of choice, not circumstance. A 2016 Undergraduate Experience Survey evidences the issue of food insecurity reaching the UC San Diego campus, as well. The study found that 28.3 percent of students surveyed “sometimes” or “often” lacked food and the money to buy more. As a result, many students turn to quick sources of calories that are often unhealthy, but readily available. To combat this growing trend, the university has followed suit with community activists in their attempts to limit food insecurity, and while these efforts have contributed to greater food security, they have not eliminated the problem. One such example is the Triton Food Pantry, which opened in 2015 with the mission to provide discreet relief to students in need of food. The University of California has also appropriated $151,000 per campus per year to expand food security, which will go towards expanding the Food Pantry, among other things. The Pantry makes a rather large dent in the availability of food security on campus, but their limited hours and the questionable nutrition of their non-perishables puts a damper on the efficacy of their plan. 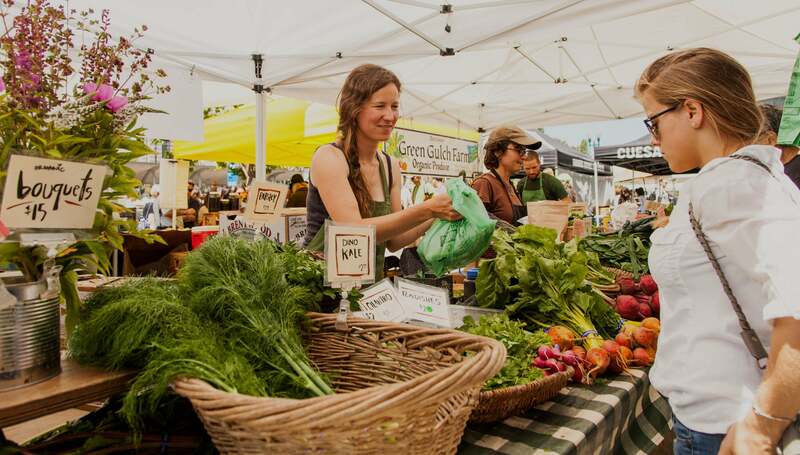 The Farmer’s Market represents another idea borrowed from low-income areas. It appears every Tuesday, introducing a variety of fresh produce while also allowing UCSD to support local farmers. It would be more accessible if students could purchase items with dining dollars or Triton Cash though this is all but impossible. Markets on the other hand can supplement access to produce via the dining dollar exchange. Housing, Dining and Hospitality markets have the potential to provide students with excellent sources of nutrition yet oftentimes produce is given a small spot near the cashier and makes up a tiny portion of the market’s shelf space. Studies have shown that, for every one meter expansion of shelves devoted to fresh produce, consumption of fruits and vegetables has increased by 0.35 servings. Unfortunately, the markets on campus glaringly resemble the bodegas on low-income areas: fattening but cheap products abound, with only an apple or two in the corner somewhere. If on-campus markets were to increase their stocking of fresh groceries, decrease the cost of these products and shift those costs to more fattening foods, HDH could incentivize healthy options and remain zero-sum. Processed foods make up 70 percent of the average American diet, but that is not because 70 percent have no access to fresh food and 30 percent do. If obesity and diabetes are symptoms, then America’s obesogenic culture is the disease and rapidly becoming an epidemic. But it stands to reason that if healthy options are not made available, it will have lasting negative effects on one’s culture of food consumption. Therefore, improved access to fresh options is not just a short term fix for health issues but a long-term goal for American society.